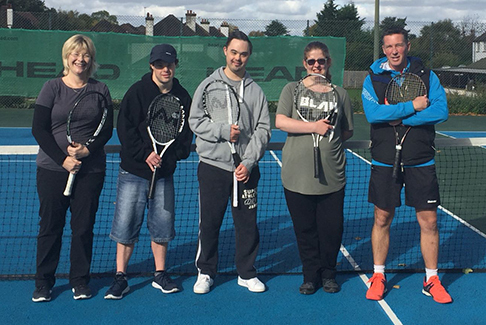 Coaching is available if you are a member of the club – it is run by Aegon Coach of the Year Award, Mark Love, and his enthusiastic MDL Coaching team. MDL Coaching was established in 2002 and has been providing tennis coaching to adults and children of all ages and standards of play. All sessions are geared up to be FUN, CHALLENGING, PROGRESSIVE, COMPETITIVE & A GREAT WAY TO MEET NEW FRIENDS. 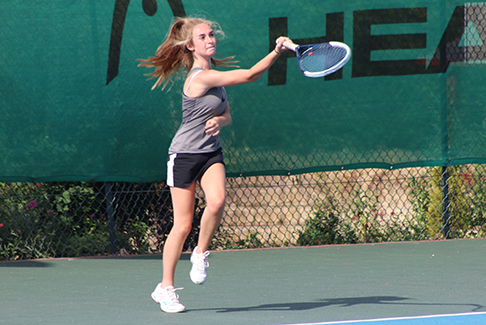 We encourage all of our older junior tennis players to help out with our tennis programmes including our disability sessions which are hugely rewarding. We also encourage our older juniors to join in with adult club sessions and team practice. Adults: coaching for anyone new to the game, for players of all standards and for those who want to recap with a few tips so they can play better. This is a FREE tennis coaching session that takes place from 6.30pm-7.30pm each Friday at the club. The session is run by 2 LTA qualified tennis coaches from MDL COACHING who are assisted by many volunteers from the tennis club. We are able to give players attending special attention, so that they can get the most out of the session. To book a place or for more information please call Head Coach Mark Love on 07761 602014. Image above, Volunteer Glenys with players Sam, Matt, Louise, and Head Coach, Mark Love. Juniors: We cater for players aged from 3yrs and upwards at the tennis club. We encourage all our parents to join the tennis club in order to play tennis with their children. Sessions are available Monday to Saturday both after school and a Saturday morning..
Children aged 11 years and over will play YELLOW ball and are grouped depending on age and ability. During every School Holidays, Tennis Camps are organised. Visit mdlcoaching.com for more details. MINI TENNIS/TOTS (Red/Orange/Green) (2yrs – 10yrs) – Split into 3 levels. Starting at Red level on a badminton sized court. Once players have the basic skills they will move to Orange level on a shortened tennis court with a transitional tennis ball. Strokes and coordination will be developed at this level. Once a player is ready they will move on to the next level – either Green or Junior, depending on age. JUNIOR COACHING (10yrs – 18yrs) – For children who can play on a full sized court. Technique, tactics, coordination and mental skills developed through a fun coaching programme. SQUAD (U12 or U18) – Sessions by invitation only, aimed at juniors competing in tournaments and teams. To be considered, please contact Mark Love on 07761 602014. ACADEMY – Juniors from local clubs by invitation. Please note: Lessons will run whatever the weather, either indoors in the Top Building for mini tennis or as a video analysis session in the coaching block so you get the most out of your tennis lessons. Players should wear warm clothes during winter months as the weather is normally dry but a little cold. Lessons include use of floodlights when needed at no extra cost. Are you interested in coaching or joining PBTC? Please click on the button to the right for the form to join Purley Bury and Mark Love’s Coaching Programme at Purley Bury for the current year.